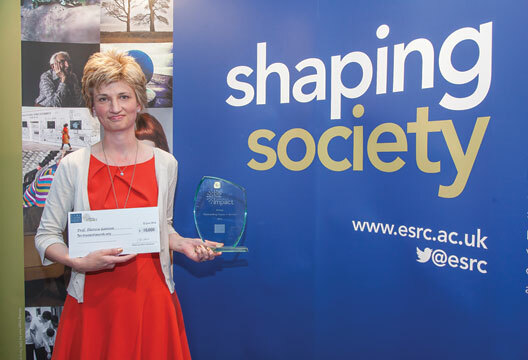 Ella Rhodes reports on an ESRC prize. The winners of the annual Economic and Social Research Council (ESRC) Celebrating Impact Prize have been announced and include psychologist Theresa Gannon (University of Kent). She and her team were awarded a prize of £10,000, for research on deliberate firesetters and a resulting treatment programme, in the Outstanding Impact on Society category. Professor Gannon spoke to The Psychologist about this work and the impact she hopes it will have in many other countries. She and her research team examined whether deliberate firesetters in hospitals and prisons had any distinctive characteristics compared with people who had never set fires – also in prisons and hospitals – to assess whether they required specialist treatment. She said prior to this work it was assumed firesetters were the same as other offenders with no particularly different psychological characteristics. However she and her team, comprising Dr Caoilte Ó Ciardh, Dr Emma Alleyne, Dr Magali Barnoux and Dr Nichola Tyler, found that, indeed, they are a special population who require a tailored therapeutic approach. From that work, and a review of the existing literature, Gannon and her team developed the first comprehensive theory of how adult deliberate firesetting evolves and developed a pilot manual including a treatment programme for people who set fires. This treatment uses a CBT approach with psychotherapeutic elements and looks at the psychological characteristics or risk factors for firesetting as mentioned above.